Do your window treatments perform the way you want or need them to? Do they filter or block out light appropriately? Are they protecting your furniture and rugs from harmful UV rays? Do they provide the right level of privacy? Do they match your current décor? Are they adding value to your home? At Windo VanGo in Baltimore, our professional consultants will be happy to help you find the window treatments that will make you answer “yes” to all of those questions. Window treatments should first and foremost control how light enters a space. From blinds or shutters with slats that tilt to other products that have light-filtering fabrics, your treatments should let the light enter your room and set a mood. What’s more, they should also protect from harmful UV rays, which can damage flooring and furniture. 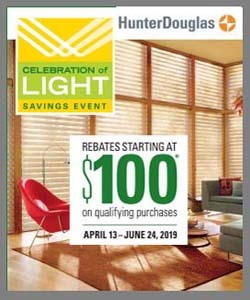 Hunter Douglas window fashions filter out at least 75 percent of the sun’s harmful rays—and many of the products, when fully closed, filter as much as 99 percent. Good window treatments also provide energy efficiency at the window by adding a layer of protection from the external elements and your home. 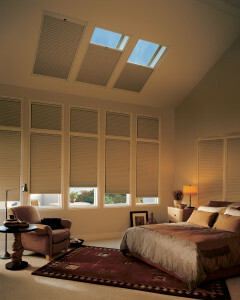 Treatments like honeycomb shades are highly energy efficient and help cut down on utility bills. One of these nights, be sure to step outside and look at your home. When rooms are illuminated and it’s dark outside, there’s a “fishbowl” effect and your privacy is the most vulnerable. Hunter Douglas, the leader in window fashions, takes security very seriously, and can offer any number of ways to provide you with the level of privacy you want. In all of its product lines, Hunter Douglas offers a wide array of fabrics and materials to choose from. There are even ways to match fabrics with accessories, to create a rounded-out style for a room. You’ll be able to find just the right touch for your décor. Technology can add convenience and security, both of which will bring value to your home. Hunter Douglas leads the way in technology with their PowerView™ App. Privacy, security, and energy management are only a few of the added benefits that come with Hunter Douglas PowerView™ App, which is available for Apple and Android devices.